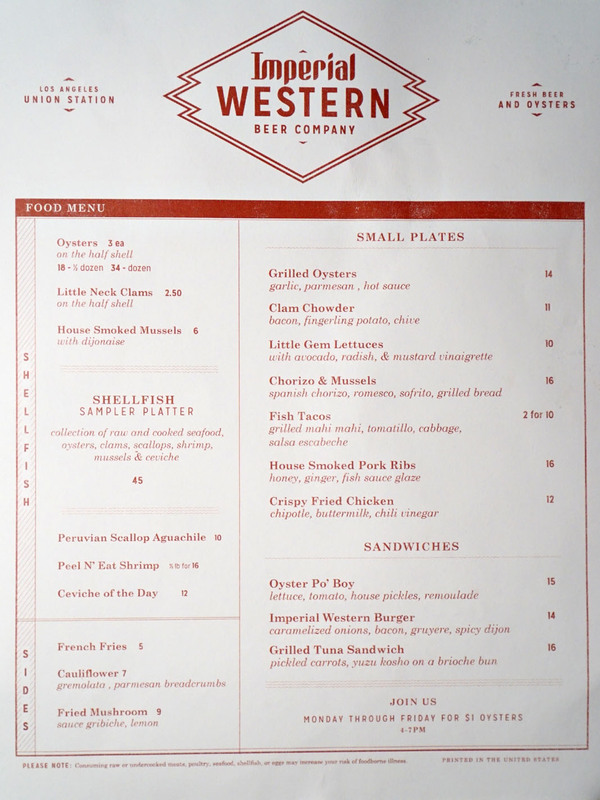 The year's most anticipated beer-related debut just might be that of Imperial Western, which opened on October 4th. 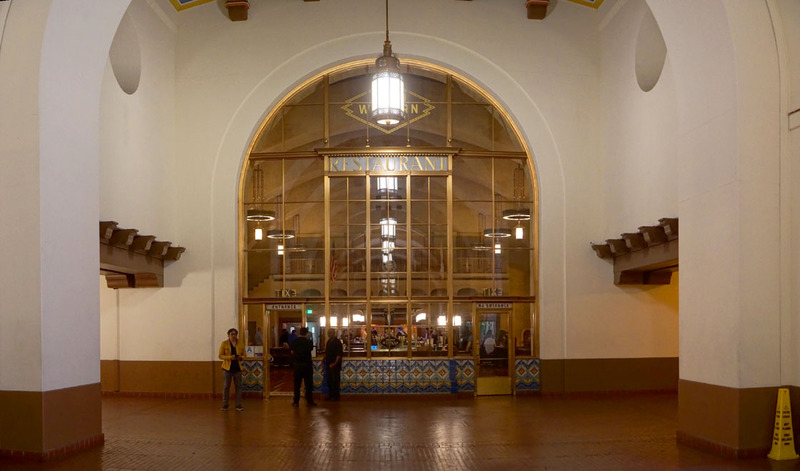 Ostensibly named after a Southern Pacific train from the 1930s, the brewery-slash-restaurant is situated in LA's historic Union Station and was actually announced all the way back in 2014. It's the work of Cedd Moses (213 Hospitality), Eric Needleman (The Spirited Group), and Brian Lenzo (Blue Palms Brewhouse), the same team behind Arts District Brewing. 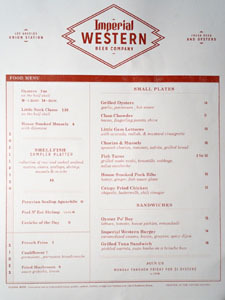 Imperial Western takes over the Fred Harvey Room, which was the site of the old Harvey House. That restaurant--part of a chain--opened in 1939 and closed in 1967, and the space has only sporadically been used since then. The Art Deco-meets-Native American room was originally penned by Mary Colter, and was refreshed by New York's AvroKO. Fortunately, much of the original detailing has been left intact, while games such as shuffleboard and pool have been added. There's a patio space as well, with its own adjacent bar to boot. To drink, you get a fairly wide selection of house beers courtesy of head brewer Devon Randall (also in charge of ADB), while cocktails are available at the attached Streamliner bar, which is run by the team behind The Varnish. 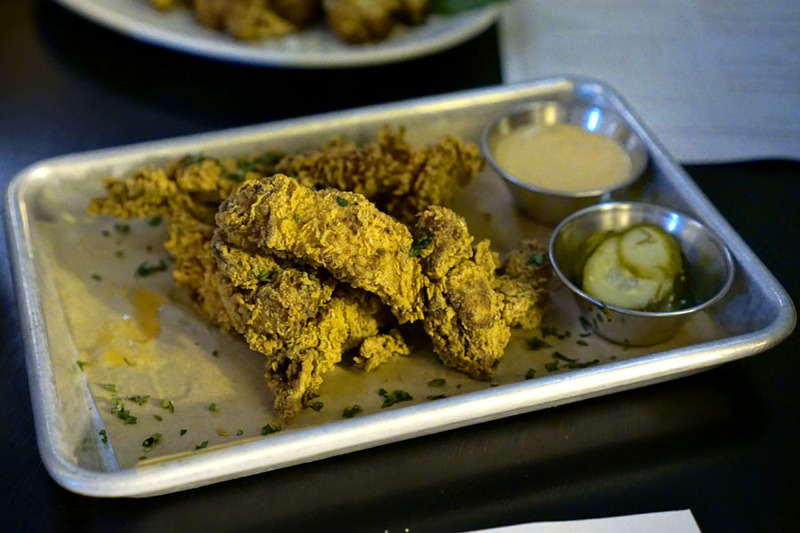 Food-wise, you'll find classically-leaning seafood selections from Chef David Lentz of The Hungry Cat. Click for larger versions. 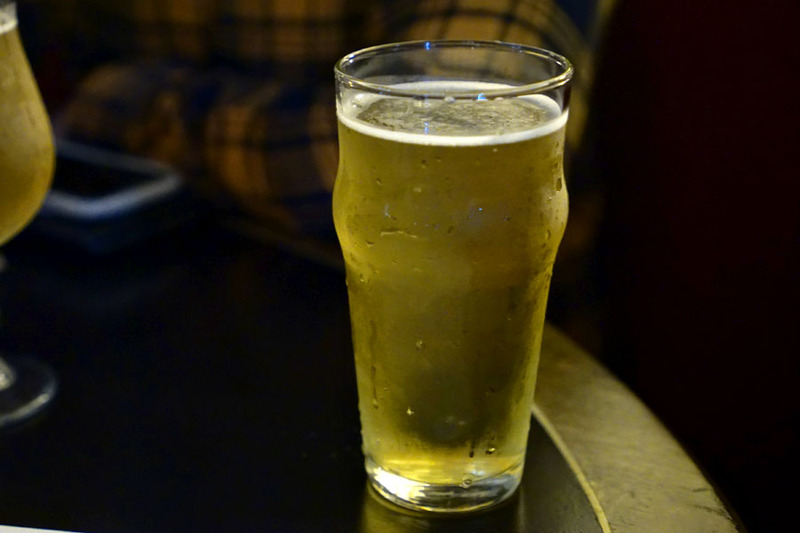 Our first beer was the Calliope [$8], a New England-style hazy IPA. It had an appealing nose that was more classically hoppy than juicy. On the palate, I got some sweet, creamy notes up front, leading to more hop bitterness and a decidedly dank character on the back end. Not bad. 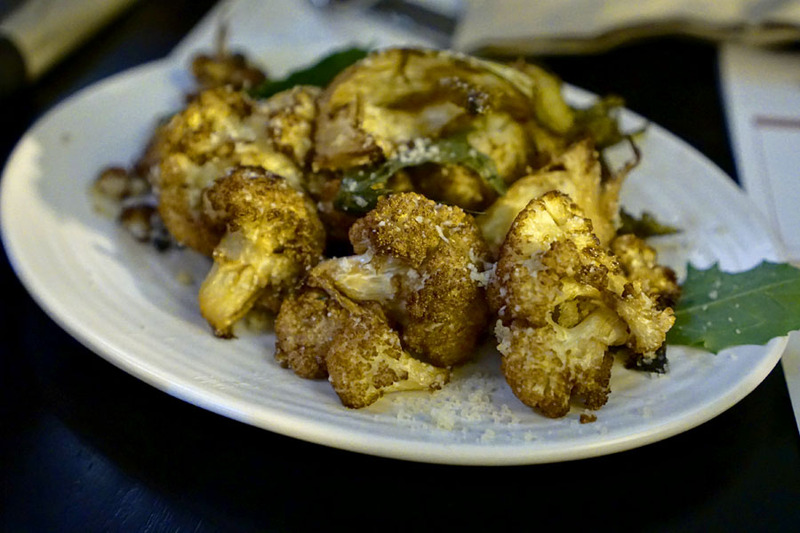 As you all know, I'm quite the cauliflower fiend, but tonight's version was a letdown. It was nice texturally, but definitely on the bland side. I really didn't get much from the advertised gremolata, though there was a marked saltiness from the cheese. 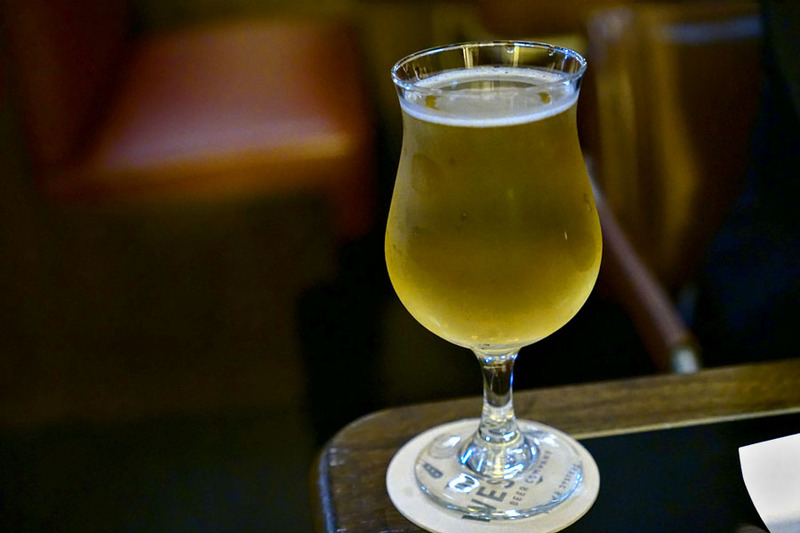 My favorite beer of the evening was the Bells & Whistles [$9], an American sour ale with peaches that was brewed in collaboration with Placentia's Bruery Terreux. It smelled great, with loads of rich peach intertwined with barnyard, while the taste showed off sweet spice and stone fruit along with plenty of sourness and funk. 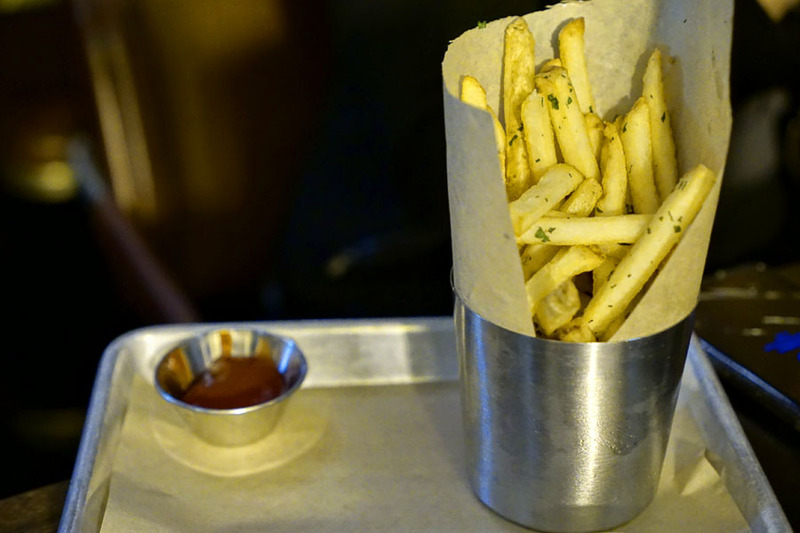 Fries were just crispy enough, with a healthy dosing of salt and herb. Tasty. Next to drink was a Kristallweizen (i.e. a filtered Hefeweizen), the Harvey [$6.50]. It didn't smell like much, with just a smidge of sweetness and metallic character. The taste was pretty straightforward and was all about that malty sweetness. The chicken tasted better than it looked for sure, and was a standout tonight. The chili vinegar gave the bird a rich, almost Asian-y type of spicing, while texturally, I found a good balance between tenderness and crunch. 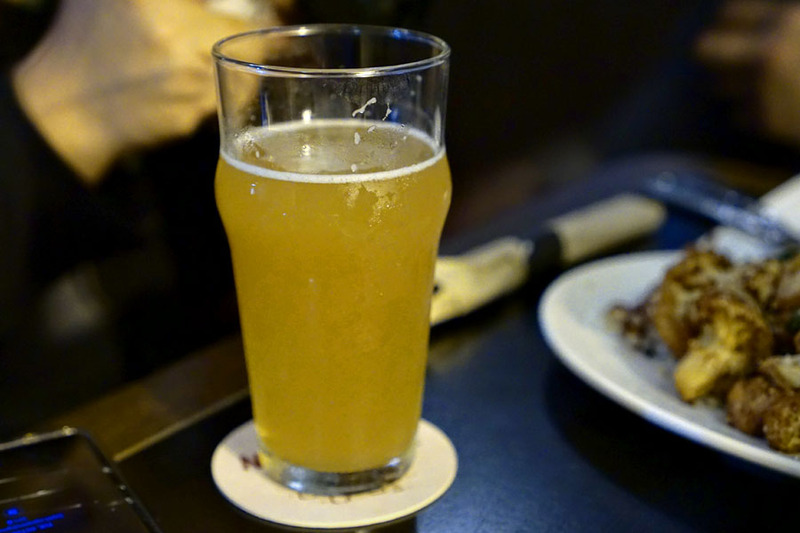 A gose, the Travel Bug [$6.50] had aromas that were bright, citrusy, and tart, with some graininess to boot. In terms of taste, it actually wasn't all that sour and had a subtle salinity and spice--a touch too restrained for me, actually. 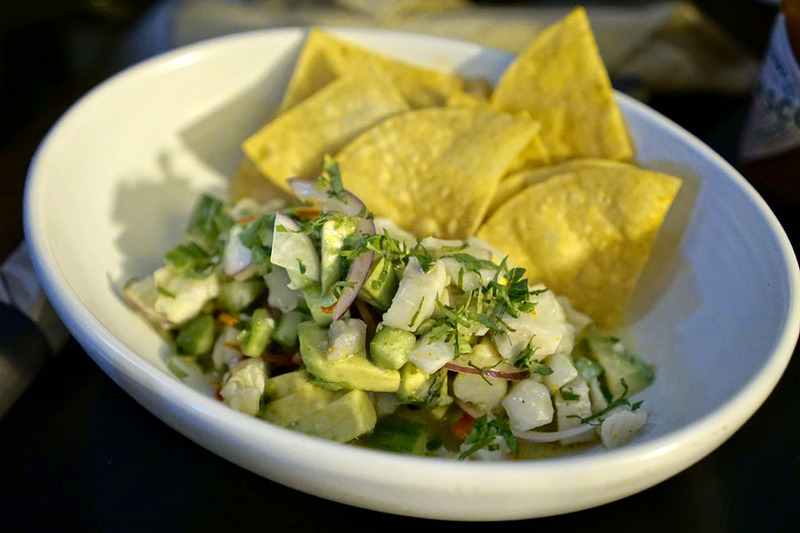 Today's ceviche featured mahi-mahi, and was a fairly prototypical version of the dish. Unfortunately it was a touch warmer than I'd prefer, and I wanted more acidity, more citrus, less avocado. 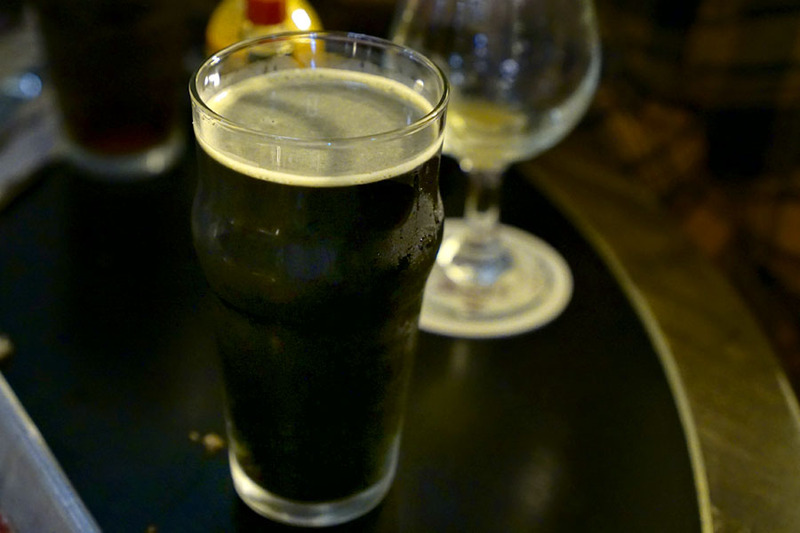 Our first dark beer, the Fordie [$7] was a mild ale made with Stumptown coffee, served on nitro. Soft, sweet bouquet rife with nutty, aromatic coffee--very nice. The palate, meanwhile, was thin, light, and had plenty more floral coffee notes commingled with nutty roast. 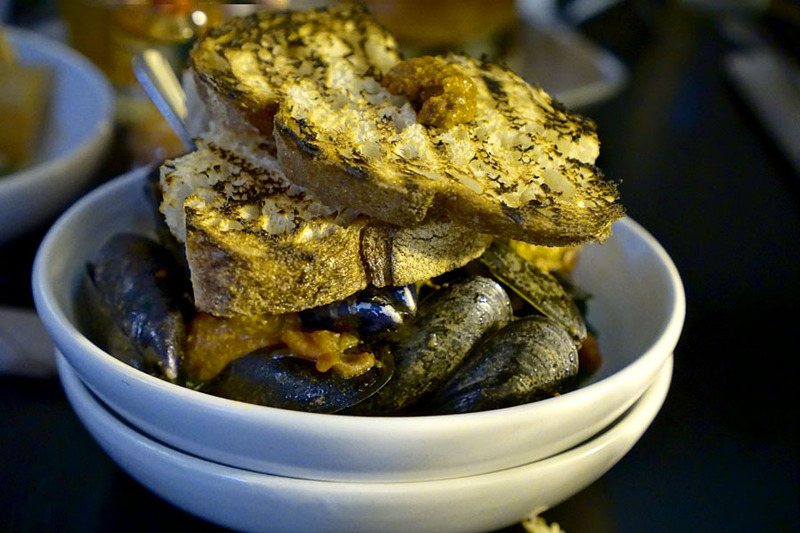 A classic combo of chorizo and mussels worked it out. The mussels were well-cooked, plump, and briny, and just made sense against the spice and savor of chorizo and romesco, all while the sofrito added an extra dimension. Nice smoke on the bread, too. 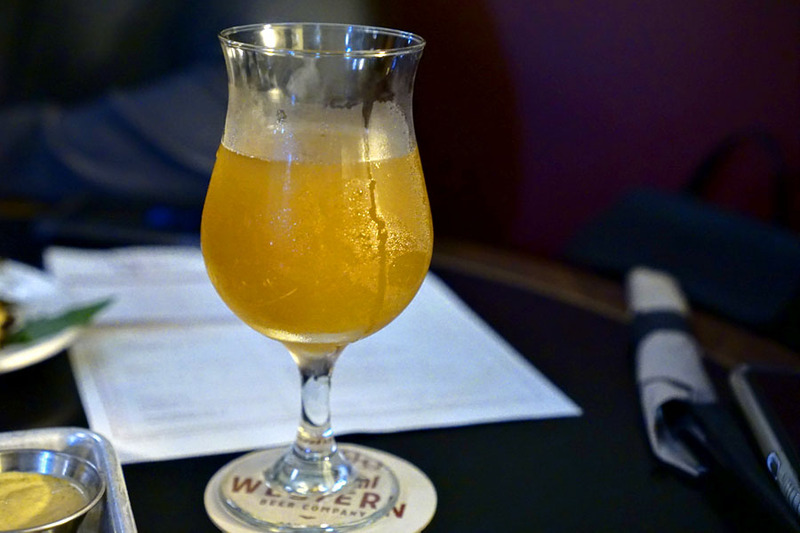 Here was a Brett saison, the Flores Solis [$8], brewed in collaboration with Arts District Brewing. The beer smelled lovely with its fruity, sweet 'n' tart nuances. Taste-wise, I got funk, bitterness, and herbs, with a lingering metallic note on the finish. 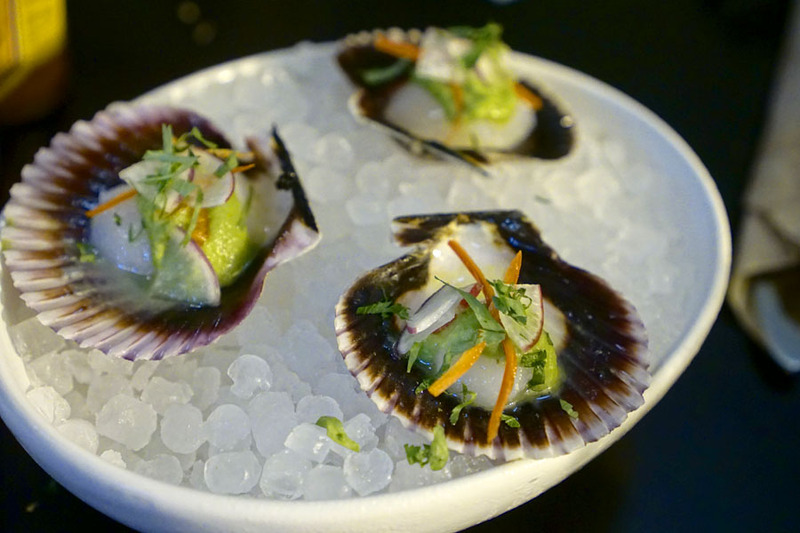 An aguachile of scallop ate fresh and clean, and showcased bright cucumber notes up front leading to a sharp, long-lasting heat. The Pullman [$7] was a sweet stout brewed with lactose. 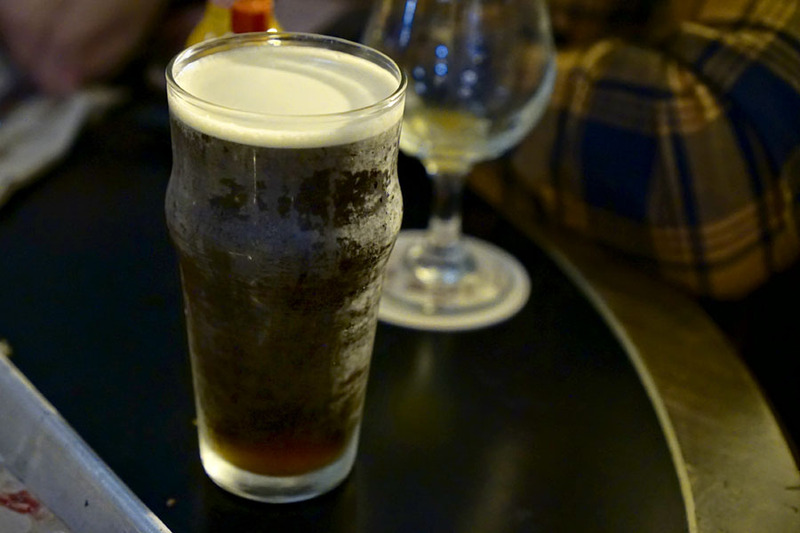 The beer had a surprisingly subdued nose, with just light coffee and roast. In terms of taste, I found more roast, more bitterness, along with some chocolate and a funky, almost blue-cheese like quality. 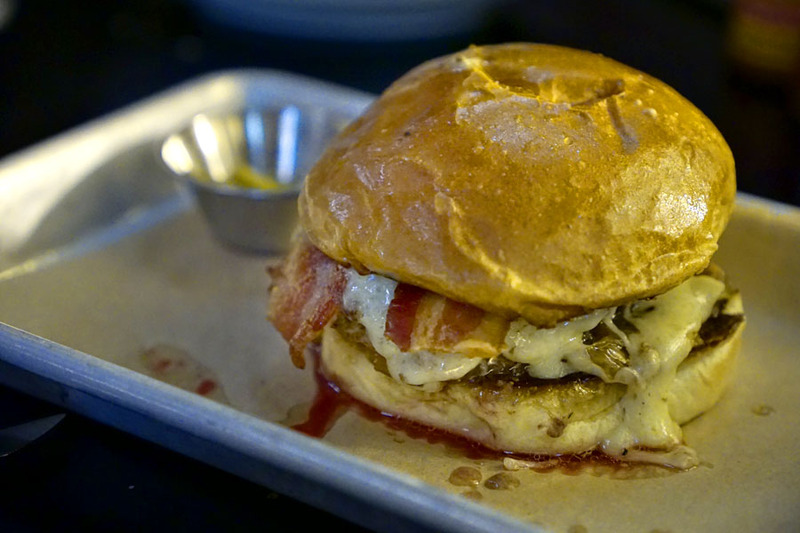 The signature burger was borderline trashy, but also damn delicious. The beef came out beautifully charred, with lots of juiciness and salt that meshed with the cheese in utterly gratifying fashion, all while the mustard imparted a touch of offsetting piquancy. 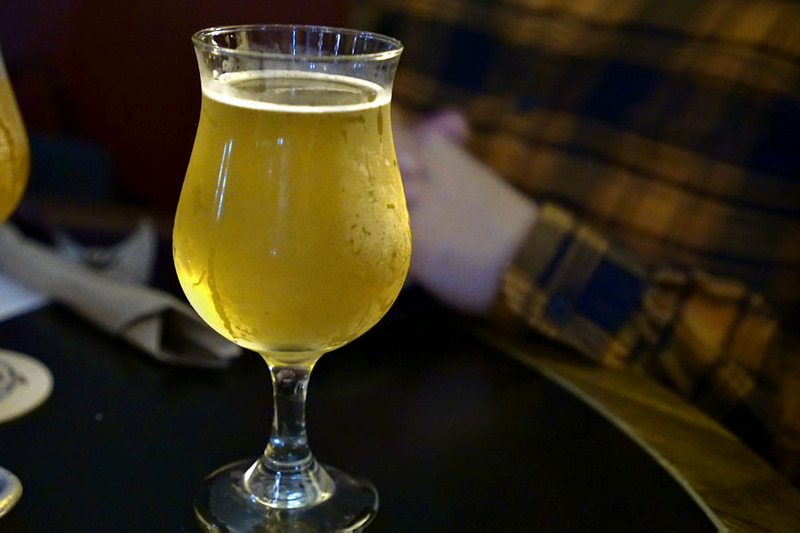 Our final beer was another ADBC collab, the Flores Minimae [$7], a petite farmhouse ale. It smelled quite nice, with some sweet, apple-y notes joined by a moderate tartness. The palate was funky and dry, and had an almost apple cider-like quality that I certainly didn't mind. 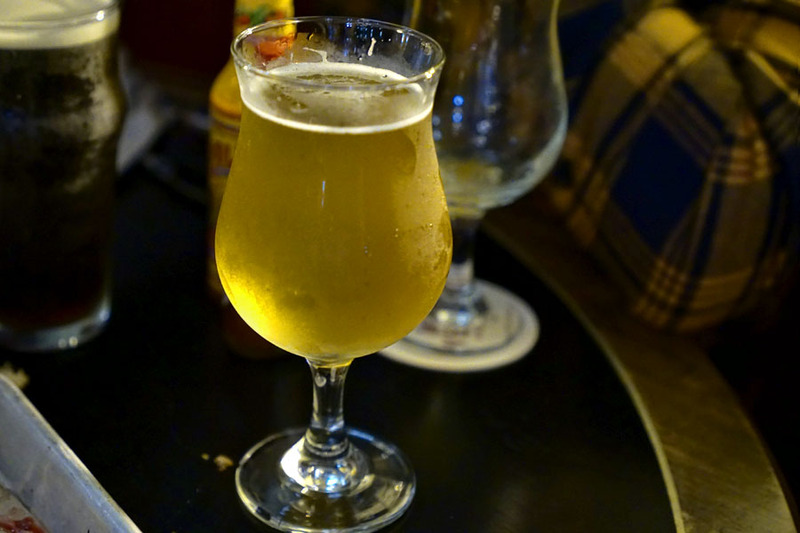 The general consensus among us was that the beer was actually a bit better and more interesting than we expected, which I'm glad to report, especially this early on. As for the food, it's nothing to write home about, but fits the bill and mostly gets the job done. Meanwhile, word is that Randall is planning on implementing a sour program at this site, so we might be interested in coming back just for that. Overall we were pretty satisfied with how this turned out. Not a hater, but all the beers look flat, lacking a head and obligatory effervescence. I took my aunt, who just got out of jail, to this dining establishment. She rated the food 4/10, which is saying a lot considering she's been eating garbage for the past year. Tìm hiểu về quy định gửi hàng đi mỹ và hướng dẫn cách mua sách trên amazon giá rẻ với trang web mua sắm trực tuyến ở mỹ cũng như phí ship hàng từ mỹ về việt nam giá rẻ.